Explaining why he decided to raise funds through public auctions particularly with regard to the February 27, 2015 auction, former CB governor Arjuna Mahendran yesterday further testified before the Commission. He said there was a meeting of the Monetary Board on February 24, 2015 in which raising government funds through public auctions and issuing thirty-year bonds were discussed. He said there were several discussions on Private Placement versus Public Auction methods at a very high level of the government, several weeks before the February 27, 2015 auction. “I was given a very clear signal by the Hon. Prime Minister that all CBSL procurement should be done in a transparent manner in light of the new government's policies," Mr. Mahendran said. Concluding his evidence, Mr. Mahendran said he had not transferred any CBSL officials with a to helping Perpetual Treasuries or to help him or Arjun Aloysius. Thereafter, Counsel Harsha Fernando who was appearing on behalf of former Deputy Governor, P. Samarasiri, questioned Mahendran on the February 27 Auction, 2015. Mr. Fernando questioned him on the 5% penal rate cut and the departmental decision of Public Debt Department (PDD) to accept Rs.10 billion at the auction. After the February 27 auction finished at the noon, Mr. Mahendran had discussed with the PDD officers in the presence of two other Deputy Governors to accept Rs.10.05 billion from the auction. Later that recommendation went to the Tender Board for approval. Mr. Mahendran said he was aware by the time he was discussing with PDD that there was a removal of 5% penal rate and it would affect the interest rate and it would increase at the auction. It was revealed that when Mr. Mahendran was discussing with the PDD, Deputy Governors Ananda Silva and Dr. Nandalal Weerasinghe were with him. Ms. Seneviratne (Superintendent of PDD), Dr. Asim (add. Director of PDD) and Ms. Muthugala (Add.director of PDD) were also part of that discussion. It was revealed that these three PDD officers were also members of the Tender Board. When Mr. Mahendran decided on the removal of the penal rate with Dr. Weerasinghe, there were three other members who were also part of that MOC meeting. They are Mr. Karunatilleke, Ms. Swarnakularatne and Mr. Rodrigo. These three members were also members of the Tender Board. It was said that the Tender Board comprised eight members. 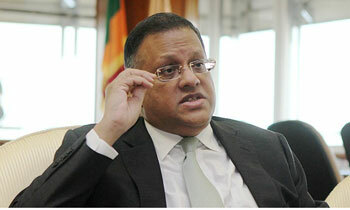 The other two were Deputy Governors Sepala Ratnayake and P. Samarasiri who were not members of PDD or MOC. Say anything you want, the fact remains you gave insider information to your son-in-law. "Mahendran: In the first Cabinet Meeting at that time the Prime Minister had said specifically that these procurements should be carried out in a transparent manner. "Then who made transparent it your son in law...? Why Mahendran is not questioned by the Presidential Commission about the money of the JO leaders he helped to park overseas? For the benefit of the people this question should be asked.